This summer, the Griswolds all over the United States are hitting the highway, making memories (and, after awhile, searching for sanity). Whether you’re located near a hot spot or the middle of nowhere, you can be sure that someone will be visiting from out of town, out of state or even out of the country. Friend-of-a-friend discounts. Encourage your regulars to bring in family and friends who are visiting from out of town. Offer patrons with out-of-state driver’s licenses a free drink or appetizer. Maximize signage. When attracting visitors, one of the best advertisements is a billboard with an Exit Now sign and a Kids Eat Free promise. If you’re not near a highway, maximize what you have. Make sure signage welcomes visitors and promotes specials. Keep the outside area as clean and inviting as possible. You may have the best wings in the world, but no one from out of town will know that… and they won’t even slow down if your exterior isn’t up to par. Hit the hotels. Often operators shy away from hotel marketing because one-time guests aren’t nearly as profitable as long-term customers. But coupons and discounts for guests will only increase your awareness at hotels and when conferences come to town – or visiting groups look for caterers – your presence at the front desk can add up to literally thousands in additional, unplanned sales. Make sure that all hotels in your area have clean, new menus with personalized maps to your location. 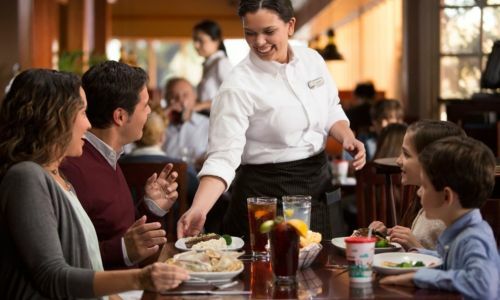 Include coupons with a substantial offer – free entrée with another – and set up a quarterly visit where you drop in and introduce yourself to the manager and the people behind the counter. When you come, bring a platter of your best appetizers or a tray of desserts. People recommend what they like… and this small investment can add up to large profits. Need more marketing ideas? Check out Slam Dunk Marketing: From Rim Shots to Results. Learn how to Slam Dunk your way to economical marketing success and limitless customer satisfaction!